Marking the end of Chinese New Year | tasty treats! Entry filed under: chinese, chinese new year, dessert, desserts, homemade, recipe. 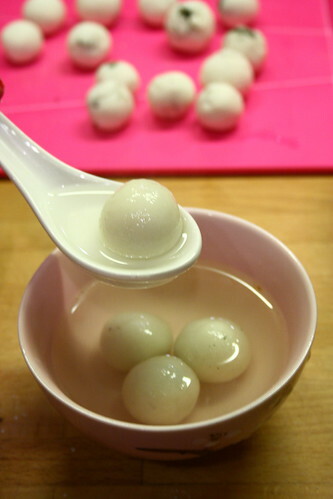 Tags: glutinous rice balls, tong yuen. Wow – these look delicious. I have the flour at home so I’ll definitely give them a go, I also love them with a red bean filling. Lizzie – My second favourite filling has to be the roasted peanuts :D I love red bean soup but not so much in tong yuen for some reason! OOOH, Ding Dong… all those childhood memories come flooding back! Haha! My mother always made them plain but really small and pink and white. I never even encoutered filled ones until I was much much older! Yours look great! 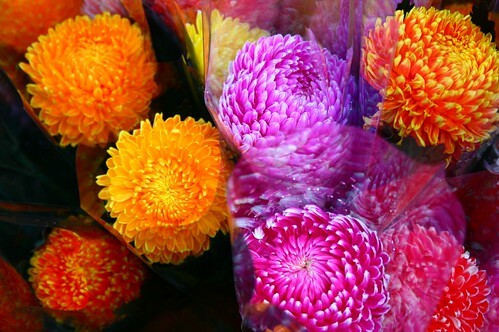 Su-Lin – Thanks! I really like the tiny unfilled ones too… a place in HK called Hui Lau Shan does a fantastic mango dessert I must copy when summer comes around. It’s mango slush/sorbet with freshly chopped mango, coconut ice cream and a handful of small glutinous rice balls. YUM! My favourite filling is black sesame. I have both rice flour and that packet of finely ground black sesame, but I don’t think I’ll ever get them to look so perfect. So I’ll invite myself over to yours instead! 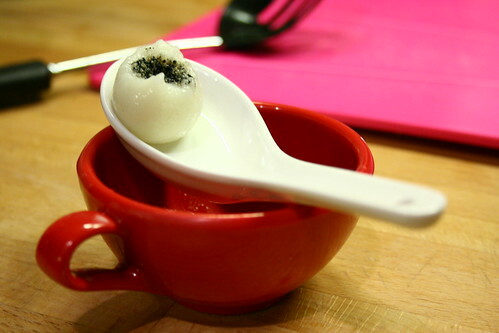 Your tong yuen look so cute! I’m ashamed to say our flat opted for pre-made frozen ones this year. But this was actually the first time I have celebrated the lantern festival as I was never aware of it before. At home my mum used to make tong yuen whenever the fancy took her. I love them filled with some plain natural peanut butter mixed with a little bit of sugar, eaten with very gingery sweet broth. Yum! I love these black sesame tong yuen. It reminds me of my childhood. I will be sure to try your recipe. amateurish way to cook said dish. you should boil the ginger like hellllll for authenticity..